On May 25th, politicians are asking the public to trust them in legalising abortion on demand. They are effectively seeking a licence to kill preborn babies, and to introduce an abortion model that is in many ways even more extreme than the British regime. So, we’re asking people to say NO to abortion on demand. And they are responding. 100,000 marched in the Rally to Save the 8th and thousands are out canvassing every week to Save the 8th. The pols are turning in our favour, as the reality of the repeal slogan become more and more evident to voters. The 8th protects the right to life of both mother AND baby. It doesn’t favour the baby over the mother - instead it asks us to love and protect them both. That’s what it means to be a progressive and compassionate society. Women are safe in pregnancy in Ireland under the 8th amendment according to the United Nations – and doctors say they have never been prevented from giving a woman any life-saving treatment she needed when it was required. Repealing the 8th won’t make women safe – it will just legalise abortion. The 8th protects preborn babies that are undeniably human and recognises the human right to life of these babies. Technology means we can no longer deny the humanity of a baby whose heart begins to beat at 21 days and who is perfectly formed at 8 weeks. Preborn babies with a disability are legally protected under the 8th amendment. In contrast, 90% of babies with Down Syndrome are aborted in Britain. This also means the 8th has helped us to develop better treatments for babies born with disabilities. For example, a leading heart specialist recently observed that, because we don’t abort babies with congenital heart disease “it allows us to build up a particular expertise here in dealing with those sick newborns". The 8th has led Ireland to support women, by offering real, life-affirming choices instead of pushing abortion. The number of Irish women travelling for abortion has fallen by 50% since 2002. If we repeal the 8th we would get the British model of abortion – that means one in five babies being aborted before birth. It would lead to 10,000 MORE abortions every year. No reasonable person should want more abortions to happen. The 8th protects women from the exploitative abortion industry, and from the harmful effects of abortion. Abortion hurts women. A 2008 study conducted by Dr. David Fergusson and published in the British Journal of Psychiatry found that women who had abortions had rates of mental disorder that were about 30% higher. In 2017, Marie Stopes, a massive British abortion chain, were caught paying staff bonuses if they encouraged women to have abortions, according to the British Care Quality Commission. The 8th has encouraged Ireland to seek better care when a crisis arises in pregnancy – for example, developing perinatal hospice care to help parents and babies where a life-limiting diagnosis has been made, instead of cruelly describing these babies as a ‘fatal abnormality’ and ignoring the distress abortion brings for women in these situations, usually involving a late-term abortion. A recent study showed that women who had an abortion after a diagnosis of a severe disability (anencephaly) were much more likely to suffer depression and despair. 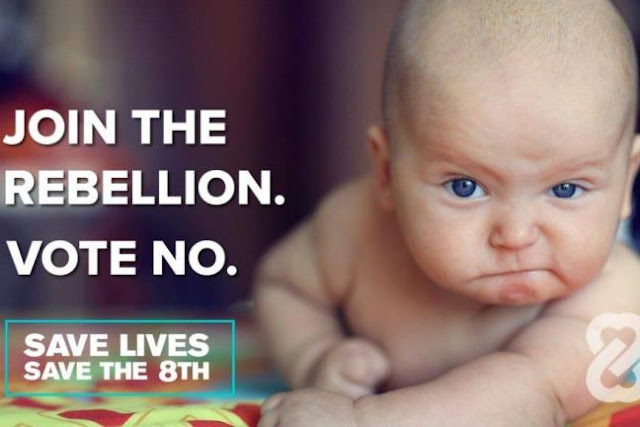 The 8th states: ‘The states acknowledges the right to life of the unborn and, with due regard to the equal right to life of the mother, guarantees in its laws to respect, and as far as practicable, by its laws to defend and vindicate that right. Joint Oireachtas Committee on Health and Children, Jan 8, 2013.